This group of endocervical cells retains well-defined cell borders and normal nuclear/cytoplasmic (N/C) ratio. Neutrophils are seen within the group as well. These are features indicating a reactive etiology. This group shows similar features, with minimal or absent nuclear overlapping, round to oval nuclei with fine chromatin and prominent nucleoli. In constrast, adenocarcinoma in situ would show feathered edges, increased N/C ratio, elongated nuclei, marked nuclear overlapping and nuclei with hyperchromatic, and coarse chromatin. 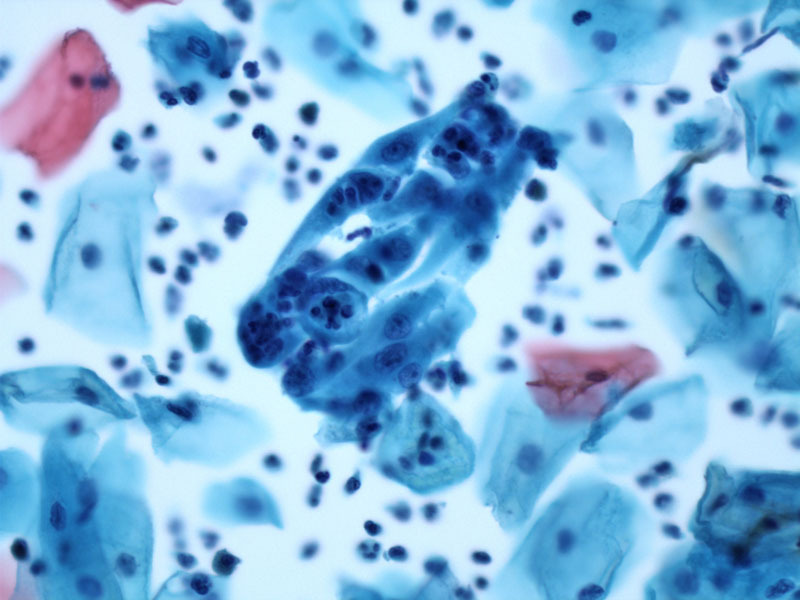 Another example of a sheet of endocervical cells showing the same features of reactivity. Multinucleation and mild nuclear enlargement may also be seen.